This event is sold out. To be added to the waiting list, please e-mail publicprograms@folkartmuseum.org. Inspired by the profound creativity of artists Carlo Zinelli and Eugen Gabritschevsky, this evening program will explore the landscape of mental health by highlighting historical and contemporary examples of artists living with mental illness. It will offer a space to consider the creativity of the human mind and the role art can play in activating expression. Two scholars working at the intersection of art and mental health, Dr. Thomas Röske (Prinzhorn Collection) and Dr. Janos Marton (the Living Museum), will present on their work, current research, and methodology. Tina Kukielski, Executive Director of Art21, will moderate the conversation. This dialogue will be followed by a presentation of Doktoress Karola and the invisible mirror, a new work by Philippe Ungar on the relationship between Dr. Jacqueline Porret-Forel and visionary artist Aloïse Corbaz. The work consists of a short film, followed by an interview between Jacqueline Porret-Forel and Philippe Ungar performed onstage by Tia Link as Jacqueline Porret-Forel and Kelly Miller as the interviewer. The project continues the conversation about the intertwining of art, life, and mental health. Dr. Thomas Röske, born in 1962 in Reinbek, Germany, studied art history, musicology, and psychology at Hamburg University from 1981 to 1986. In 1991 he finished his Ph.D. on the intellectual biography of art historian and psychotherapist Hans Prinzhorn (1886–1933). From 1993 to 1999 he was assistant professor in the Department of Art History at Frankfurt University. During this time, he also curated exhibitions for various art institutions in Germany and Great Britain. In September 2001, Röske became curator of the Prinzhorn Collection at the Psychiatric Clinic of Heidelberg University Hospital, a museum for the historic collection of artworks by those living with mental illness from all over Europe. Since November 2002, he has been the director of the Prinzhorn Collection, which stages internationally touring exhibitions about art and psychiatry. He teaches regularly at the Centre for European Art History at Heidelberg University and at the Institute for Art History at Frankfurt University. In 2012 he became President of the European Outsider Art Association (EOA). Röske has published extensively on art and psychiatry and on outsider art. Other fields of interest are art and art theory from around 1800, and modern art, especially expressionism, art and homosexuality, and art and the outsider experience. Dr. Janos Marton is director of the Living Museum. Born in Hungary in 1949, he received a Ph.D. in psychology in 1976 and a M.A. in fine arts at Columbia University in 1980. He then went to work as a psychologist at Creedmoor Psychiatric Center, the largest of five state-run psychiatric institutions in Queens, New York. In 1983, Dr. Marton invited Bolek Greczynski, a Polish artist known for his political artwork and experimental theater, to join the hospital staff at Creedmoor. Together, the two guided the transformation of an abandoned building on the campus known as Building 75 into the Living Museum, a thriving art space for patients. For over thirty years, the Living Museum has provided a space for people living with mental illness to transform their lived experiences into artistic expression. In 2015, Dr. Marton was awarded the fourth annual Dr. Guislain “Breaking the Chains of Stigma” Award, an initiative of Janssen Research & Development, LLC, and Museum Dr. Guislain. Born in 1962, Philippe Ungar is a writer and an audio archivist. Since 2001 he has worked for several art foundations, private collections, and galleries in Europe and in the United States, including the Yves Klein Archives (Paris), the Panza Collection Archives (Mendrisio, Switzerland), the Niki Charitable Art Foundation (Santee, California), among others. Prior to his current career, from 1985 to 2005, he taught philosophy in high school and at the University Institute for Professors Training (IUFM) in Lille, France. During this time, he was also a journalist for Swiss French Radio. His most recent publication is Soulages in America (New York: Dominique Lévy Gallery). Tina Kukielski is Executive Director of Art21. She was a cocurator of the acclaimed 2013 Carnegie International, bringing together thirty-five established and emerging artists from nineteen different countries. During her time at the Whitney Museum of American Art, from 2002–2010, she worked to acquire and mount exhibitions by a wide range of celebrated contemporary artists. As lead curator on the Hillman Photography Initiative at the Carnegie Museum of Art, Kukielski has launched a number of digital initiatives and film series. In 2014, Kukielski coproduced a documentary film about Andy Warhol in partnership with artist Cory Arcangel documenting a digital conservation project which brought renewed attention to nearly forgotten artworks made by Warhol on an Amiga personal computer in 1985. Kukielski is a contributor to Artforum, Mousse Contemporary Art Magazine, and the 2015 anthology on digital art, Mass Effect: Internet Art in the Twenty-First Century. She has been a visiting critic at Columbia, Yale, Princeton, and Carnegie Mellon, and has taught courses in the MFA programs at Parsons School of Design and the University of Hartford. She received her B.A. in art history from Boston University and pursued graduate coursework in modern and contemporary art at the Graduate Center, City University of New York. Eugen Gabritschevsky: Theater of the Imperceptible is organized in collaboration with La maison rouge, Paris, and the Collection de l’Art Brut, Lausanne. These two exhibitions art supported in part by Joyce Berger Cowin, the David Davies and Jack Weeden Fund for Exhibitions, the Ford Foundation, Janssen Research & Development, LLC, public funds from the New York City Department of Cultural Affairs in partnership with the City Council, and the New York State Council on the Arts with the support of Governor Andrew M. Cuomo and the New York State Legislature. Banner image: Carlo Zinelli (1916–1974), untitled (detail), San Giacomo Hospital, Verona, Italy, 1961, gouache on paper, 19 3/4 x 27 1/2 in.,Collection de l’Art Brut, Lausanne, Switzerland, cab-2128. Photo by Henri Germond © Collection de l’Art Brut, Lausanne © Fondazione Culturale Carlo Zinelli. 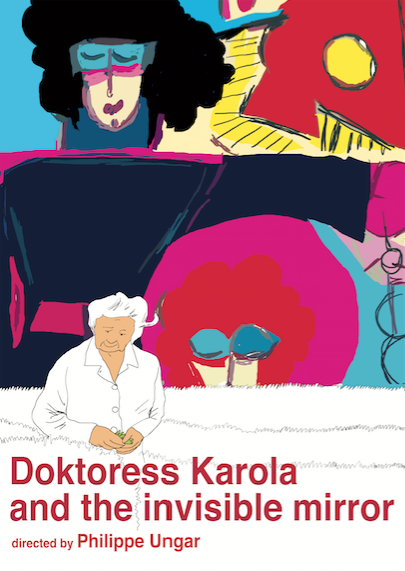 Top image: Poster for Doktoress Karola and the invisible mirror by Gilles Tevessin.